One of the comments I hear from friends and family a lot is – “How do you find the time to read so much?” Just like them – and all of you – we’re really busy. I have a full time job (and other teachers out there – you know it’s WAY more than 40 hours a week), I have two young daughters, a husband, I’m involved in various committees and organizations. It’s challenging and honestly, sometimes my reading life is not where I would like it to be, and I have to push myself out of a rut. But – when things are going well, these are the four things that I have found to be helpful to making more time to read. Because it’s really not FINDING that mythical time, it’s MAKING time – and making it a priority. Today, I’m angling this conversation more toward advice for adults, but when I talk to my students about making time for reading, these are the same things I talk about with them in our reading conferences – and with my own kids at the dinner table or in the car. Once you get kids thinking about it, they can often come up with LOTS of times they’re kept waiting and could take advantage of that with some reading time. I know, I know – that’s SO easy to say, we’re all susceptible to the siren call of our phone, or favorite tv show, or video game, but it’s that mindless scrolling and swiping and flipping and clicking that can be such a time-waster. And before you know it, you’ve spend three hours playing Candy Crush or binge watching Fuller House. So it’s all about choices and just being more aware of how your time is spent – and helping children start to be aware of that for themselves. And if you’re coming at this from a parent point of view, sometimes you just have to put time limits on those screens. I absolutely have to push back against that at my house. For me, I know that if my phone is within reach, I WILL pick up if I hear an alert or even get an urge to look something up. I know myself enough to know – sadly – that I NEED to put my phone on the other side of the room when I truly need to focus on what I’m reading reading. And I think being open about that with kids can help them be self-reflective, too. This one may be the most important. If you want to make reading a priority, you’ve got to dedicate time to it every day. And that will look different for everyone, for every child, depending on their schedule and personality. In my house, we try to take the 30 minutes after dinner as a “no electronics” reading break. And then I have the 20 minutes before bedtime with our daughters as our shared read aloud time. Personally, I love to read over breakfast when the rest of my family is still asleep and the house is quiet. Settling into a favorite reading chair, beanbag – even under the table where my daughter likes to read – is another a good way to make that habit stick even more. Set a time and set a place. Those are four things that help me make more time for reading, but I’d love to hear how you do it and share those ideas on a future show! Email me at booksbetween@gmail.com or connect on Twitter or Instagram at the handle @Books_Between. In this segment, I share with you three books centered around a theme and discuss three things I (or my students) loved about each book. This week, in honor of the Summer Olympics, I’ll be talking about three great sport-related novels or series: Booked, Roller Girl, and the Rip & Red Series. The Black Out Poems – There are only a couple of them in the novel, but they inspired such creativity in my students, that we spent hours one afternoon making our own. If you are unfamiliar with Black Out Poems – essentially you rip a page out of a book (great use for old titles you cull from your library), then take a black sharpie and cross out most of the words on the page to reveal a poem with the words left over. They’re beautiful and simple, but incredibly powerful. If you’re interesting in learning more, I’ll drop a link in the show notes to a really good tutorial. The school librarian – Mr. MacDonald – known as “The Mac”. He’s awesome with his funky sense of style, his love of dragonflies, and his famous high top Converse. He lets Nick and his friend Coby hang in the library and sort of looks the other way when they are playing blackjack instead of reading, and he’s always trying get a book into Nick’s hands. Toward the end of the novel, there’s this incredible moment where he visits Nick at a hard time in his life and reads the end of All the Broken Pieces out loud to him with such skill and passion that strangers crowd around and give this amazing librarian a standing ovation. I loved “The Mac” – such a great character. But – I have a big soft soft for librarians anyway. The books within Booked – In the beginning of this story, Nick finds school-assigned reading pretty boring and daydreams about soccer games in English class instead of paying attention. I think a lot of kids can relate to Nick in that way. But he slowly starts to come around to reading – of course, having his crush, April, recommend books does get him started. Booked is one of those books that leads you to more and more books – like Out of the Dust, When You Reach Me, The Outsiders, – I personally blame page 243 for the largest Amazon book bill I think I’ve ever had. 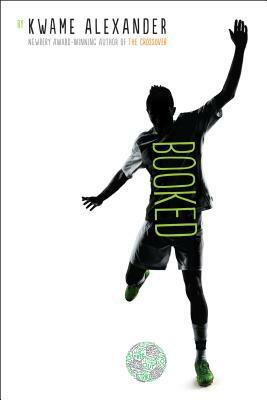 To use a word from the novel itself, Kwame Alexander’s Booked is unputdownable. Our second sports-related book this week is Victoria Jamieson’s Roller Girl. It’s so hard to pick favorites, but this one was definitely in my top three reads of 2015. It’s a full-color graphic novel about a 12 year old girl named Astrid who decides to sign up for Roller Derby Camp after going to a bout with her mom and her best friend, Nicole. And it does NOT go easy for her – she stinks at skating so at first she’s falling, she has trouble stopping and ends up bruised and really disheartened on her first day. But Astrid is fierce and does NOT give up. How the friendships are handled – That move from elementary to middle school can be tough on friendships and Roller Girl really does a good job of capturing this. At the beginning of the book, Astrid’s best friend is Nicole and Astrid assumed that Nicole would be going to roller derby camp with her and carpooling together. Well – Nicole choses dance camp instead and throughout the book the girls become more and more estranged as Nicole veers toward boys and shopping and hanging out with a girl that once teased Astrid. What I really liked was that Jamieson doesn’t demonize Nicole – she’s kind to Astrid even after their falling out. And Astrid is not perfect either and can be insensitive sometimes to her new friends at roller derby camp. She has a lot to learn – like most girls this age. Learning about true Roller Derby culture – I am going to really date myself now and admit that the only thing I thought I knew about roller derby was what I had seen in old movies like Rollerball with James Caan or Kansas City Bomber with Raquel Welch. And while the roller derby in this book IS fierce and there is blocking and pushing – it’s not at all the crazy violent sport I thought it was. It’s tough but with a huge flair of fun and the skaters that Astrid looks up to have cool names like Rainbow Bite and Scald Eagle, colorful dyed hair, tattoos, crazy clothes and creepy makeup. And through Jamieson’s awesome illustrations, you get to learn a lot about the game, the roles of the jammer (the position that Astrid really wants to be) and the blockers, and how to score points. And mostly you get to love the heart of these athletes and how they bond to form a strong team together. There’s really something special about that roller derby community. The Mom in the book – I just love this mom. She takes her daughter to a roller derby bout for an “Evening of Cultural Enlightenment “, she is (mostly) patient when Astrid gets snippy with her when shopping or when Astrid dyes her hair blue, and is even understanding when Astrid lies about how she’s getting to roller derby camp practices. When my girls start going through that preteen rough patch of figuring out who they are, I hope I can handle it half as well as Astrid’s mom. 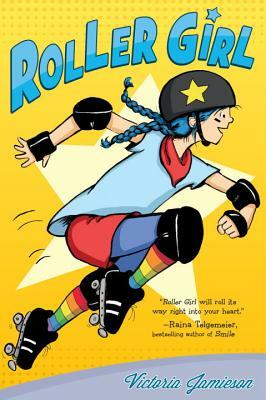 Roller Girl is about grit, perseverance, and finding yourself – and middle grade readers will really love it. My final sports-themed recommendation this week is the Rip & Red series. If you have not yet read Phil Bildner’s Rip & Red books – go grab them! They are incredible! 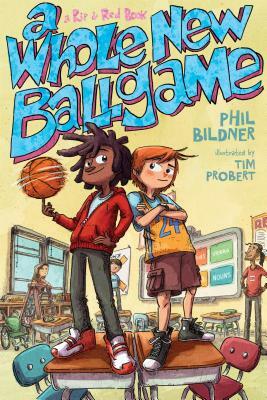 So far, there are two books in the series – the first one, which I recommend you start with, is called A Whole New Ballgame. It’s about a 5th grade boy – Mason Irving (called “Rip”) who is essentially the main character and the story is told from his point of view in 1st person. And his quirky best friend, Blake Daniels, is called “Red”. Red has a tough time at school – he’s on the autism spectrum, doesn’t like physical contact, and DEFINITELY doesn’t like any kind of change. But their 5th grade year – everything seems to be changing. In the first book, that change takes the form of HUGE budget cuts at their school that result in not having the teacher they expected. Instead, they have Mr. Acevedo who turns out to ALSO be their new basketball coach. He is NOT your typical teacher – long hair, multiple earrings, tons of tattoos – and an unconventional way of teaching (and coaching!) as well. So Rip and Red both have quite a bit to get used to. The second book, Rookie of the Year, picks up pretty soon after the first book left off and this time, change comes in the form of a new (and horrible) cafeteria menu and a new cafeteria staff and also a new girl – Tiki – who throws everybody for a loop. The basketball play-by-plays. I’ll admit up front that I’m not a HUGE basketball fan. I’m more of a root for my home team (Syracuse University) during the Final Four and cheer on the underdogs on my bracket. But even I got into the great descriptions of the games – and kids who love basketball are really going to get into it. The Diversity. And the fact that the plot was NOT ABOUT how the characters overcome some big conflict related to that. It’s simply a great story about a 5th grade class that happens to include all kinds of children. Bildner does that “no-big-deal” approach to diversity really well and always keeps the focus on it being fun. So let me give you a quick example – in the second book (Rookie of the Year) there is a new girl, Tiki, whose family is from Egypt and she and her family are Muslim. And she casually mentions on the first day that she can always tell when her family is about to move because her Dad shaves his beard because people at airports act weird around him if he has his beard. And it’s a quick conversation – not a big lesson on racial profiling, but honest and still fits the light tone of the story. They have humor but also deep emotional moments – especially Rookie of the Year. I got to the chapter titled “Sentencing” and I was sitting on the sidelines of a lacrosse field where my daughter was practicing , and I was blinking into the sun trying not to sob and make a fool of myself. And – it’s true – I am known to be rather “leaky” at sad moments in books, movies, even commercials – but it’s a rare book that can make you laugh out loud AND cry out loud and the Rip & Red books did that. So if you’re looking for a few great sport-related novels for your tween readers, absolutely check out Booked, Roller Girl, and the Rip & Red Series. A few months ago a friend of a friend on Facebook messaged me for some book recommendations for her 4th grade son who loves to read funny books. Well, not only do I love a good cry, but I love a good laugh, too. So here are few books that are perfect for a kid who appreciates something funny. Suggestion #1 – Hilo: The Boy Who Crashed to Earth by Judd Winick – It’s an action-packed, fast-paced graphic novel that had me laughing out loud and the new sequel is excellent as well. Like the title basically tells you, it’s about a humanoid who falls to the planet and the two kids (DJ and his friend Gina) who have to help him find his way. A quick heads up – the first novel ends on a killer cliffhanger so you’ll want to have book two (Saving the Whole Wide World) ready to go. Suggestion #2 – My Life As A Book by Janet Tashjian This is a fun read about a kid named Derek who is assigned some summer reading that he tries to avoid at ALL COSTS in favor of crazy adventures with his friends and trying to figure out a family secret about himself. If you have a reader that liked style of Diary of Wimpy Kid, I feel like this is a really good next step. It has some illustrations in the margins, but is more like a traditional chapter book. Also – the reading level on this is higher than the others so if it’s not a good fit now, save it for down the road. This one is also part of a series so they can jump right into the next one if they like it, and from what my students say – you can read each one on its own. A third suggestion for a child looking for a funny book is The Tapper Twins Go to War (With Each Other) by Geoff Rodkey. It is the story of the epic sibling conflict between twins Claudia and Reese. It’s hilarious and with lots of fun illustrations, pictures, screenshots of text messages, and annotations in the margins from each of the twins battling to get their story told the right way. This was a HOT read in my class last year – and the next book – The Tapper Twins Tear Up New York – is, I think, even better. Those are a few suggestions to get you started looking for books that appeal to a kid who likes to read a story with lots of humor – Judd Winick’s Hilo, Janet Tashjian’s My Life as a Book, and Geoff Rodkey’s The Tapper Twins Go to War (With Each Other). Alright – that’s it for the Q&A section this week. If you have a question about how to connect middle grade readers to books they’ll love or and idea about a topic we should cover on a future episode, please email me at booksbetween@gmail.com or message me on Twitter/Instagram at the handle @Books_Between. Thank you so much for joining me this week. You can get a full transcript of this show, and all the other episodes, at our website – BooksBetween.com with links to every book and video I mentioned today. And, if you like the show, please subscribe on iTunes or tell a friend! Thanks and see you in two weeks! Bye!